Wow. Coming back to you from General Convention and revisiting the beheading of John the Baptist doesn’t quite match up with the Good News I experience. I’ve spent the nearly past two weeks being surrounded by Episcopalians from all over the world, worshipping with hundreds and, at times, thousands of others. We had a revival, folks! We sang and clapped and nearly danced at our seats not just in English. We sang in Spanish and offered prayer responses guided by our chaplain who was raised in South Africa. It was a joyous, mountaintop experience, though there were times we could tell we had a mountain to climb as we pulled ourselves through long legislative sessions and voting processes guided by parliamentary procedure. It was joyful, and I felt the presence of God in our midst in our prayers, laughter, and our being mindfully present to each other. So I understand the story of David rejoicing in the street as he and others carried the ark of God. For them, this ark contained the actual presence of God, which makes it all the more significant for who carried it and where it was located. It was a big deal, and in their music and dancing, I feel a kinship for the rejoicing taking place. But there’s something else in that story, too. There’s one who looks on with “disdain in her heart.” Michal, daughter of Saul, is not happy. Maybe she’s bitter that it’s not her father carrying the ark and being celebrated in the streets. The darkness of her disdain contrasts sharply to the joy surrounding the ark of God. I sense an echo of a similar disdain in Herodias, wife of Herod, former wife of Philip his brother. John the Baptist didn’t approve of their relationship, and while Herod didn’t necessarily appreciate John the Baptist’s judgment, he somewhat protected him . . . in prison. He protected him until in an evening of joyful merry-making, he promised the dancer anything she asked for. Dutiful daughter she was, she consulted her mother who seized the opportunity to quench her disdain and kill John the Baptist. As if he had been double-dog-dared in front of all his friends, Herod granted the request of his oath rather than protect the one he knew to be holy and righteous (something he repeats with Jesus). So where’s the Good News in this? I commend the Epistle this week for giving us a reminder of God’s blessing to us: grace and salvation through Jesus Christ. God wants for us to live into our grace and salvation, to live into the holy and blessed ones we are created to be. This state of being is already available to us, but we tend to get so inwardly-focused that we forget that we have a life centered in Christ. That’s easy to say, but why, then, do we get bogged down with enmity, spite, and disdain, if not outright hatred? One might say we lose our way. You’ve probably heard Presiding Bishop Michael Curry mention the Jesus Movement, how it leads us to becoming Beloved Community, which is, after all, God’s dream for us. A movement truly involves moving, changing, maybe even transforming. Lucky for us, at this General Convention, he gave us a resource for living into a Jesus-Centered Life, and he and his evangelism team simply call it “The Way of Love.” It’s appropriate, I think, that for us to live into God’s dream asks of us to walk the Way of Love. Truly, this is the Way that Jesus showed his disciples from Day 1. We received these handouts at worship the first night, I think it was (I’ve been to a lot of services lately!). I have a few more and can order more if you don’t get one or if you’d like to have more to share with others. 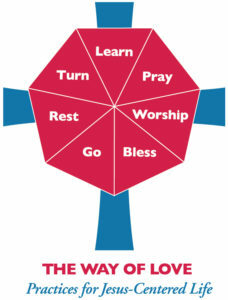 These little things outline the practices for Jesus-centered living. There’s no fancy acronym: just The Way of Love. Turn – PB Curry knew it wouldn’t take if we started with “Repent,” but that’s what it means. We realize we’re losing our way, and we want to turn toward Jesus in our lives so we can live into our blessed grace and salvation. So we TURN: pause, listen, and choose to follow Jesus. I think of a tune from a Richard Scarry video my kids used to watch when they were little: “Stop, look, and listen.” When we come to an intersection, crosswalk, or crossroads, we have to stop and listen, and we make a conscious decision about where we’re headed. Learn – We’re not walking blindly. We have guidance, and we get it from reflecting on Scripture each day. If we want to live like Jesus, we have to know what that looks like, sounds like, tastes like, and maybe even smells like. What did Jesus do in his life and say in his teachings that offer us instruction? Pray – We not only ask God for help and give thanks, but we listen. We set apart time each day to dwell with God, to abide in God’s presence. We might not yet be able to pray without ceasing, but we practice prayer every day. Bless – Sure, it’s the priests and bishops in the church who bless in the name of the Trinity, but we all bless one another when we share our faith and when we unselfishly give and serve as so many of you do. When we experience the joy of being in the presence of God, we almost can’t help ourselves but share that with others. On the first day of walking in downtown Austin, we were approached by a homeless man (one of many there). My companion, maybe more experience at navigating larger cities, managed to walk on, but I made eye contact at the same time he was asking for money. He had joy in his bright, light blue eyes as he said, “Hey, you see me,” and gave me a fist-bump. He proceeded to walk with us to our destination and then go on his way, but I learned a bit about Ricky as we walked, though I realize it may or may not be true (especially the part about Stevie Nicks). I hope my seeing him with light and love of Christ was more of a blessing to him than the money I gave. Go – Throughout the gospels, especially after the Resurrection, the disciples are told to GO! Several of the sermons admonished us to GO! Go outside the church and do the work of the Lord. Because we have to move; we can’t stay comfortable, even if it’s within the confines of our church. In our going, we are told to “cross boundaries, to listen deeply, and to live like Jesus.” We don’t have to go far, but it is worthwhile to go where we don’t feel comfortable. Maybe that’s volunteering at the animal shelter or food pantry, where you experience sadness or smells that you’d rather avoid. Maybe it means going to the Salvadoran restaurant that you don’t go to because they speak mostly Spanish, and you’d be the minority. Jesus was always going to the other side, talking and eating with people he wasn’t supposed to. How often do we do the same? These practices outline The Way of Love for us, and they’re circular, not linear. They invite us to assess where we are and begin again when we feel ourselves losing our way, maybe even experiencing a hardening heart. They’re grounded in Holy Scripture and the life of Christ, but most importantly, they’re rooted in God’s blessing, God’s dream for us. God’s dream for us is ours to be had when we walk in the Way of Love, the Way of Christ, and that’s Good News for us all.